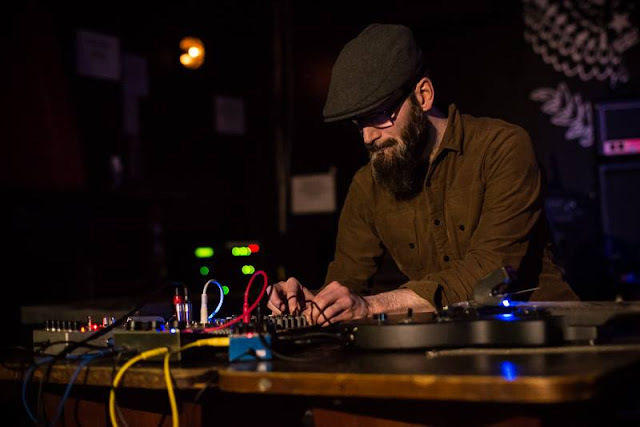 Creator of Drones & Other Noises, Performer, Improviser, Installations builder, Lee Riley is a sound artist based in Oxford (UK). His work explores ways of not just hearing sound but seeing it from unique perspectives formed in installation, performance and improvisation. Sound has a strong visual presence throughout his work. In performance Lee explore extended techniques of playing guitar and other instruments. He improvises musically both as a solo artist and with other musicians. 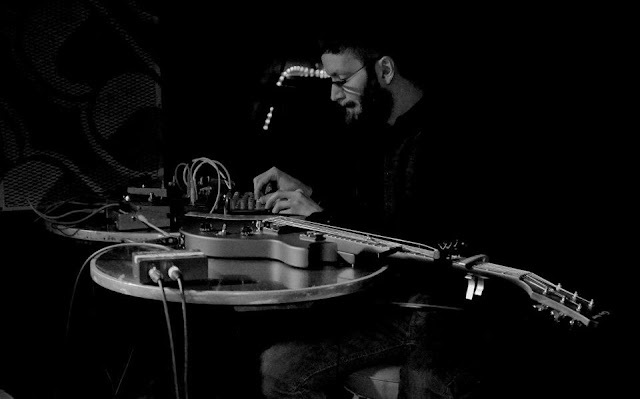 Lee Riley has shared collaborative projects with other musicians and visual artists. His background includes print based graphic design and photography. Since 2007, Lee have explored the world of sound. In October 2012, he completed an MA in Composition and Sonic Art at Oxford Brookes University. In May/June 2015 Lee curated the 'Seeing Sound from Inside-Out' exhibition at FaB15 (Fringe Arts Bath) He has installed works and performed at 'The Space Between' Salisbury Arts Centre, FaB14&15, OCM (Oxford Contemporary Music) Open 2013 at the Pegasus Theatre, Modern Art Oxford, Ovada Warehouse in Oxford, The Old Fire Station in Oxford and Arts Complex in Edinburgh. He has also played in various venues across the UK - venues include pubs, clubs, empty shops, basements, a living room, a chapel, an office complex, a warehouse, a library, theatres and gallery spaces. I think technique is the most important aspect of music, all musicians have their own way of approaching an instrument the technique can be different depending on the players ability and style, I don’t really regard myself a guitarist, but a guitar is my current choice of instrument, my technique is abstract and the guitar is a tool I use to create sounds that form my music. I think listening is the most useful thing in creating music; I listen to certain tones and frequencies that is important within my sound. I record my practice sessions and listening helps me recreate elements and ideas when it comes to playing live. How's your musical routine practice? I tend to practice more when I have a gig. I try to practice most weeks but find having breaks keeps the sound fresh each time I play. Most of my techniques are improvised but I do have a palette I work with and it evolves every time I play depending on the setting and mood. 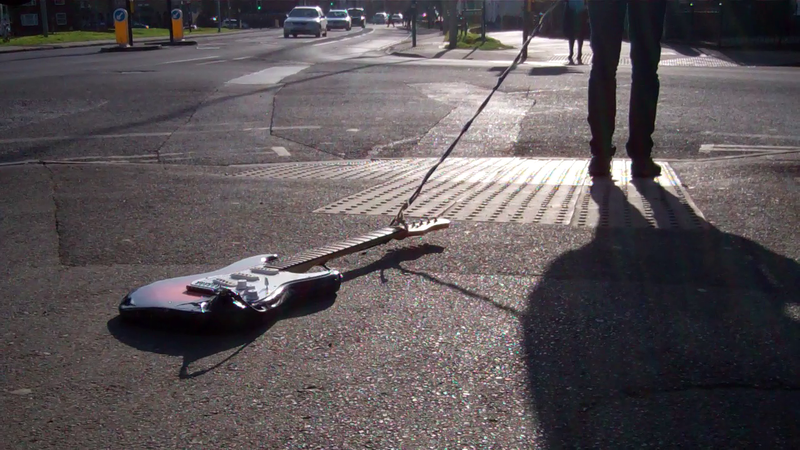 The most extrange techniques I used are definitely dragging a guitar through the streets. It is hard to pin point a first sound experience, I have always been interested in the sound of engines and machines. I love the fact you can make the guitar sound like a thundering engine or make machine like sounds out of it. I never thought I would be on the stage doing it, in the past I have always loved watching gigs and still can’t believe I get up there myself. I would love to work with Mike Patton, I admire lots of his work, his voice is amazing and he is not afraid of trying new things and has crossed paths with many other musicians I really like. You can learn from others when collaborating adapting your techniques to work in a new context. I would especially like to work on a score based project with him. I need music because it is a form of expression and creation. I have always had a creative mind and music seems to be my main focus at the moment. I do find it hard to say way it is so important but I couldn’t live without it. I think my music has got darker not sure why? I have seen and heard lots of live music but when I first experienced Sunn O))) I actually felt the music in a new way quite literally. I want the audience to experience that with my music in some way. Sunn O))) are dark and intense and it isn’t a direct influence but is certainly had an effect on me. I think art to me is similar to music; I like to experience something new that I have not seen or heard before. Sometimes art can be an unexplainable experience, I like to take that experience away with me and reflect on it later. I have a links to all of them; I am interested in the performance side and how the audience react to performance art. I have been doing more performance based art recently and worked with a dancer that I hope to so again soon. It is another form of expression and still fairly new to me. Sound and body have a strong relationship that is fascinating, I noticed my movements more than usual when collaborating with Macarena Ortuzar. My first was ‘Metallica - Black’ and most recent that keeps getting stuck in my CD player is the recent ‘Chelsea Wolfe – Abyss’ album. I guess the heavier side of music has always been with me. Finding your audience can be hard, but with digital music at the finger tips it is a good source for bedroom artists to get noticed. I am still exploring it and not sure of the best options. But it is how I listen to my friends who are in the same boat. It is a good way to support other music makers out there. More collaboration, I have enjoyed working with some good friends recently. I have a couple of splits and compilations in the pipe line. I hope to record a full length album in the near future. More of a studio based setting with big amps. I hope to gig more in 2016 after a trip to America in March. I am currently working on a new trio with Mike Bannard (guitar) and Chris Pethers (drums). A recording project at the moment, maybe live at some point, maybe even a release. They are from a great band called Masiro. You might like them.